The script and concept were very interesting and well done! The actors did a great job telling this story as well. Congrats Greg and the cast/crew on a great show! Wow. I wish I could’ve seen ALL FOUR versions of this show. 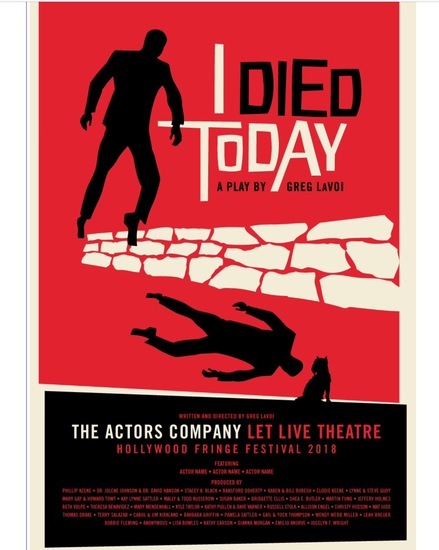 Greg’s concept for “I Died Today” is one that I have yet to hear of. I LOVE it! The same story told from four different people creates an experience like no other at the Hollywood Fringe Festival. That is just his concept. The script itself is very enjoyable and thought-provoking. The story is like a roller coaster of feelings and thoughts that lead to many moments where I audibly said “hmmm…” and after the show, I couldn’t help but reflect on my own life. This is what you want in theatre. The actors did a phenomenal job as well. Do yourself a favor and go watch this show as many times as you can and enjoy this great work by Greg.